“The Hue of You” is a subject that could be interpreted either very literally, or as far out metaphorically as you can stretch your mind to. In the end I decided to head down the literal route. This image is taken whilst enjoying one of my very favourite activities – namely chilling out at the beach with my best amigos. 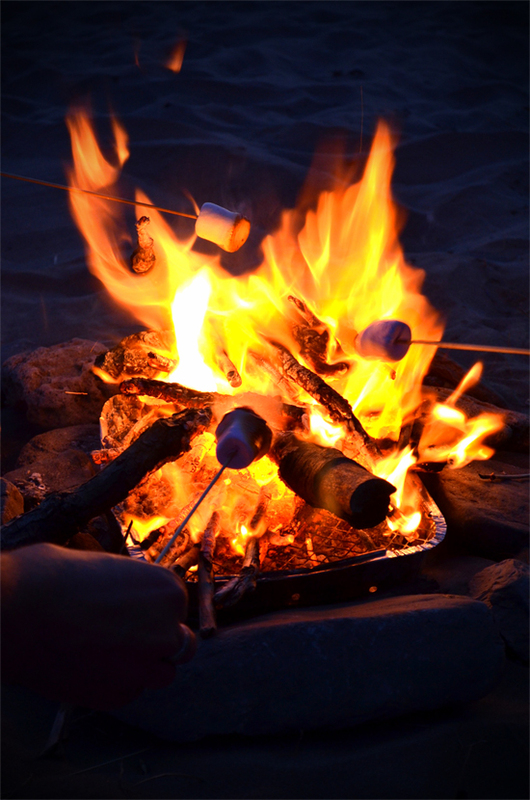 And it’s bathed in the heat of an evening campfire, with the warm orange hues of the flames lighting up the beach. And our marshmallows! As such this photo gives you a snapshot of my favourite times illuminated by the vibrant hues of my favourite colour, orange – a colour choice that may not be a surprise to you if you’ve looked around the site before, and perfect for presenting “The Hue of Me”. that’s a very vibrant photo. Now, I’m craving s’mores. Yay! Haha! I have to say I’m not usually a big fan of them, but they were perfect for an awesome summertime beach barbeque! This is how your blog makes me feel. Makes me miss my old traveling days… I like how you’re posting in retrospect though. I’m planning to do a bit of that over at mine… Just to spice it up a bit. I can’t believe in all of these places you haven’t had a “situation” like the one I mentioned. Just wait, my friend. It’s coming for you. (pun slightly intended). I think I’ll always be posting in retrospect, as I don’t really plan on travelling with a laptop. Think I’d be too worried about it in my luggage! Seriously hoping I never have to deal with that dorm-room “dilemma” though, that’s for sure! Haha! You’re wise about the laptop! I had my Macbook Pro stolen out of my backpack while I was getting on a bus in Xian, China. I seriously went into a depression over it! I ended up buying some weird little Acer Netbook but yeah… not the same.